Most of us think nothing of letting our kids play out in the garden. But literally tens of thousands of children end up in A&E every year due to garden accidents. Keeping your kids safe outdoors is a matter of supervision and setting the right stage. So if you want to let your little ones out and don't want to deal with injuries, here's all you need to know. The first thing that you should deal with is fencing or marking the boundaries of your property. If you have younger children then a stout fence that's high enough not to be climbed over is essential. Older children can deal with the concept of bushes or trees marking property lines. But with younger ones you'll need to ensure that they're safely contained, that fences are in good order, and that gates are locked with bolts at shoulder height to an adult. 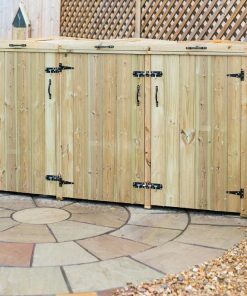 If you have structures in your garden, like sheds, greenhouses, bike stores, or bin stores, then these should be inaccessible to kids. A simple padlock will do the job. 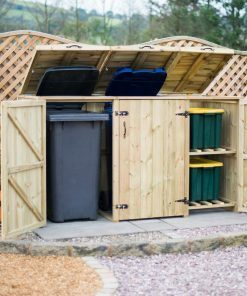 Sheds tend to have power equipment and heavy boxes, which even small children can accidentally pull over, whilst greenhouses may contain poisonous fertilisers. Bike stores and bin stores should be locked simply to prevent kids from scratching up precious bikes and emptying rubbish by pulling bins over. Water features, such as ponds, are obviously a danger to smaller kids. Pond nets are great for keeping birds away from your fish, but they don't do a great job of stopping kids falling in unless they're especially sturdy. A metal chain link pond cover is your best bet, or fence the pond in if you can. It only takes a couple of inches of water to drown, so don't be complacent even if your water feature is a small one. If you have a swimming pool, either in ground or above ground, the pool should be secured. Plastic coverings are not suitable if you have unsupervised children in the garden, you should have a rigid pool cover. Ideally, pools should be fenced, gated and locked to avoid accidents. If you have pets then you need to ensure that all dog mess is cleaned up before your kids go outside. And it's best to double check that neighbourhood cats haven't been using the sand pit as a litter box too. Animal faeces can contain toxocariasis, which can cause blindness, epileptic fits, and asthma too. This is especially important if you have toddlers, but even older kids can make the mistake of not washing their hands after touching something dirty. Once your kid is old enough to understand, it's best that you walk them through the limits in the garden. Which tools are they allowed to touch? Which must they never touch? If you know that there are dangerous plants around, point them out and tell your kid why they mustn't go close to them (including stinging nettles!). There should be clear rules in place about riskier activities such as using trampolines, tree houses, or swing sets. Letting your kids do the gardening with you will teach them the dangers of tools and certain plants, whilst allowing them to learn gardening skills at the same time. If you're getting your kids into gardening then there are some important things to remember. Don't forget sunscreen and lots of drinking water if the day is hot. Youngsters overheat and dehydrate faster than adults. On the other side, make sure that they're well wrapped up if it's cold. And ensure that tetanus vaccines are up to date, since garden soil can contain tetanus. If you're kids are helping you out, you might want to invest in some kid sized gardening tools. A smaller shovel, trowel or fork will lessen the chance that they injure themselves with a larger, adult sized tool. Large trampolines are one of the most common additions to a garden if you have kids, and around 11,000 children are injured each year on these toys. If you do get a trampoline then kids should be supervised. A maximum of two children at a time (one is better), shoes should be removed, and trampolines with safety nets around the perimeter are far safer than those without. If it's possible, secure the trampoline to the ground with stakes to prevent it flipping over. Playing in the garden is not only great fun, it's healthy too. But all equipment and toys should be appropriate. This means age appropriate, a toddler shouldn't be using a swing without seat restraints, for example. But also safety appropriate. When buying garden equipment for kids do look for safety certifications first. All equipment or toys suitable for children should have a European safety standard certification clearly marked on the packaging. Finally, consider how appropriate toys are to be used outdoors. Plastics, for example, often degrade when left outdoors, and the resulting breaks can be sharp and therefore dangerous. If you opt for plastic slides or drivable cars it's best to bring these items inside during bad weather. Letting your kids play out in the garden is a great way to keep them healthy, active, and out of your hair. But accidents do happen. A little planning and preparation can make the difference between fun play time and an afternoon spent at the hospital. Having a garden is a great opportunity for kids to get outside time, but it's up to you to ensure that they're safe out there.